6 Uses for Coconut Oil. About a month ago, I started to take up Slimming World. It wasn't until then that I really started to note what I was eating and eating different types of foods as healthier alternatives. For example, I've been using Quorn a lot recently as the syn values are much lower in these than the real sausages or mince and to be honest, once you've included in in your recipe, you can't really taste too much difference. 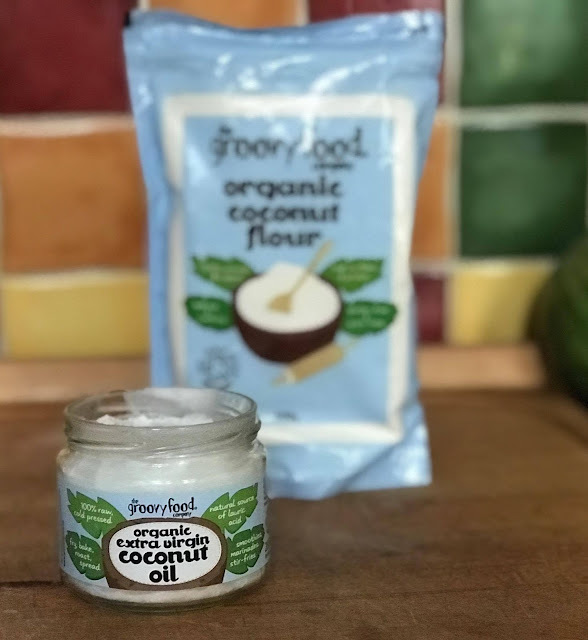 Although my replacement for oil has been FryLight, I was recently sent some Coconut Oil from the people at The Groovy Food Company to play about with and thought I'd share how I got on. Since receiving my Coconut Oil (& a packet of their Organic Coconut Flour), I've been using it for a whole range of things that I never considered. There must be a million and one uses for Coconut Oil out there and surprisingly, they're not all food/cooking related. Here are the ones that I've been loving. 1) Baking. Over the past weekend, I used my Coconut Oil & Flour to make some Paleo chocolate chip cakes. Although they didn't turn out as well as I'd hoped, (I'm not that great in the kitchen) the flavours in there tasted incredible. 2) Frying. Using the Coconut Oil when making my Egg Fried Rice made a great alternative to using the Olive Oil I'd usually use. The slight coconut flavour bought a new flavour sensation to it. 3) Speeding up Metabolism. Seeing as I've been on Slimming World, the aim is to lose weight but still eat all of the foods you love. I've heard that Coconut Oil can speed up your metabolism and therefore increases weight loss. Obviously it doesn't mean it drops off you but every little helps. 4) Chapped Lips and Moisturiser. At the moment, I'm suffering with the dreaded cold. My lips have been terribly dry along with the edges of my nose from all of that blowing. Applying the Coconut Oil to these areas has really helped nourish these areas. 5) Acne. My skin is really spot prone at the moment too. Applying the oil to these areas has helped reduce the redness and inflammation and has been a little life saver. 6) Oral Hygiene. If you've not come across oil pulling, where have you been!? Swishing a spoon full of Coconut Oil around your mouth for 10 minutes every day helps to whiten teeth naturally, fight gum disease and help to clear your sinuses. This has been coming in handy with my cold and I'm getting a little whitening session at the same time. Plus, it makes my throat feel less inflamed too. For my first time using Coconut Oil, I think I've been well and truly converted into making this a staple in my life. It literally has so many uses throughout the house and in life that I'm not sure how I've never thought to buy any before. Plus, our three year old Beagle, Bob can't get enough of the stuff either. It's totally safe to give your furry friend orally and has a whole stack of benefits for them too which I never knew about until I looked it up. The Groovy Food Company Coconut Oil and the rest of their Coconut range can be found here alongside some recipes and their online shop. Tell me, what's your favourite use for Coconut Oil?